Chase just introduced Ritz-Carlton as their new transfer partner for their Ultimate Rewards Program. 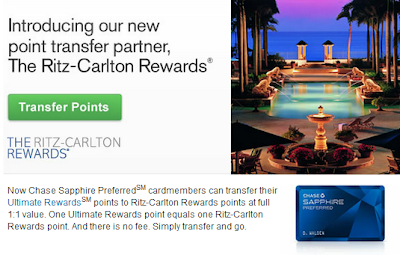 You will be able to transfer 1 Ultimate Rewards Point for 1 Ritz-Carlton point which in my opinion isn't a great value, since for a Tier 1, stay one would need 30,000 points. I value Ultimate Reward Points at 1.31 cents per point, so 30,000 points values at $393. So for me, transferring over my valuable Ultimate Rewards Points is not worthwhile unless they have a great special or a big promotion. There is no fee when you transfer points to any of their partners. To transfer your points to Ritz-Carlton, you will need to be a member of The Ritz-Carlton Luxury Hotel Rewards Program. You may only be a member of The Ritz-Carlton Rewards OR Marriott Rewards. You can't be a member of both. But when you stay at a Ritz-Carlton Hotel you may collect points or miles to your Marriott membership account number. You can also transfer your points from one program to the other. To transfer your membership account from The Marriott Rewards Programs to The Ritz-Carlton Rewards Program and only collect points or miles via the Ritz-Carlton Rewards Program click here. See below to see, how many points you can redeem for an award stay. If you are looking for Elite Status when staying at a Ritz-Carlton, you can apply for The Ritz Carlton Rewards Credit Card by J.P. Morgan. Earn 50,000 bonus points with your first purchase. Ritz-Carlton Rewards Members can now redeem Points for Elite Merchandise on our Rewards Retail Site. Redeem Points for Exclusive Personal Shopping Experience with Neima Marcus or Bergdorf Goodman. National Geographic's Photography Workshops Exclusively for Rewards Members. how many points does it take for a night at a ritz? I have updated the post with how many points are required for each tier.